Arenastaden is a new, trendy part of stockholm containing residential areas, shopping, offices and the centerpiece the Friends Arena. Friends Arena is Scandinavia’s biggest indoor Arena and holds up to 65,000 people. 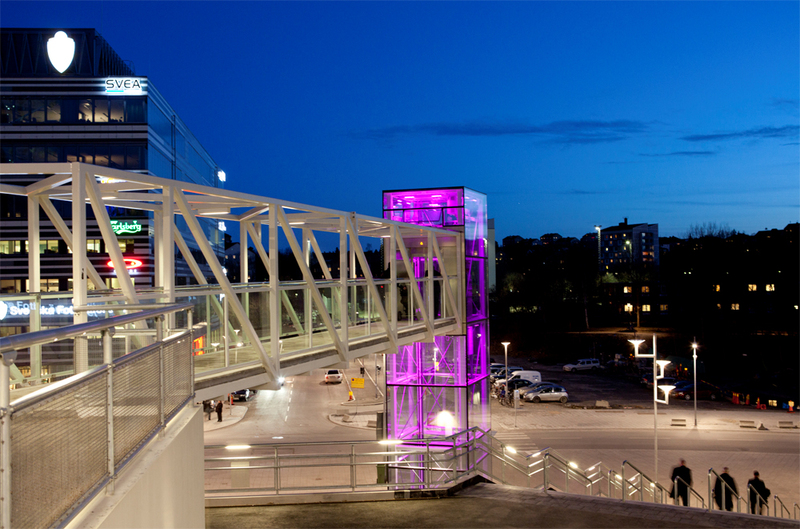 Tyréns, one of Sweden’s leading urban planning consultancies, won the assignment of planning lighting around the arena, in surrounding streets, bus terminals, ramps, roundabouts, squares, lifts and stairs. As budgets were limited, Tyréns had to come up with creative solutions both regarding choice of materials and fixtures. The fact that lighting was only considered subsequent to construction proved to be another massive challenge. This made it difficult to mount the fixtures without them being too visible on the structures. Also there was a demand for low power consumption combined with high output to ensure and maintain visibility even when football matches or other very bright shows and events were to take place in the Friends Arena. Tyréns solved this by installing “double” fixtures, so half of them can be turned off during normal days and the other half can be turned on for maximum impact when the arena is full. As part of the final solution, colored lighting has been installed in various areas around the arena for different purposes and to create different kinds of effects. Below the ramps leading up to arena for example, fixtures with color filters cover the pillars with narrow beams and work as a complement to the street lights. The lift towers are covered with light from Martin Professional Tripix 300 fixtures in different colors to create visual attraction and obvious meeting points; for example: “Let’s meet by the purple lift”. Martin Professional and Tyréns also have several other projects in the pipeline. In Åkersberga, Sweden 9 Tripix 300 are installed in a subway (see sketch in gallery) as part of a bigger project to install effect lighting in dark and unsafe areas of Åkersberga. Another upcoming project is lighting for a unique fountain for the Municipality of Malmö. Read more about Arenastaden and Friends Arena here.